Background: In Japan, the GERD management guideline (GERD-GL) was issued by the Japanese Society of Gastroenterology in 2009. However, there have been few reports on the actual conditions of GERD treatment in Japan. Objective: The aims of this study were to prospectively investigate the compliance of gastroenterology physicians with the GERD-GL and to clarify follow-up rates for long-term management, dropout rates in each stage, symptom improvement rates and secession rates. Method: Between January 2010 and December 2010, patients with GERD who consecutively visited 12 medical institutes(5 hospitals and 7 clinics) in Sendai City were enrolled in this study. 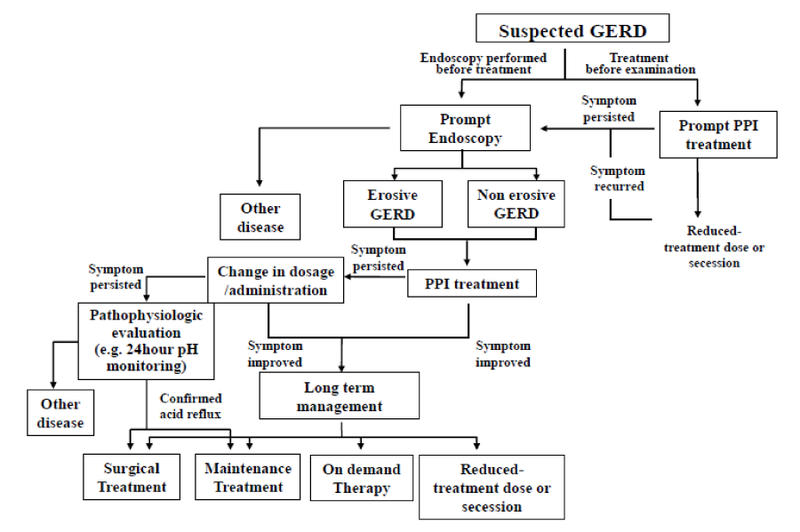 Medical treatment was conducted fully in accordance with the GERD-GL flowchart. A PPI was given in the range covered by the Japanese medical insurance. Subjects initially received Rabeprazole (RPZ) 10mg daily. 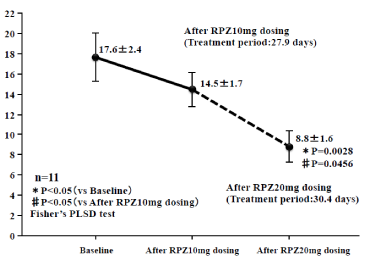 When symptom improvement was not observed, they received RPZ 20mg daily. The FSSG, a GERD-specific questionnaire, was used for the diagnosis of GERD. Subjects with scores≧ 8 were diagnosed with GERD. Symptom improvement was defined as scores of FSSG< 8 or ≧ 50% score reduction after dosing. Design and Setting: The Prospective study from multiple institutions. Results: The number of cases was 211 (male 88, female 123). Mean age was 53.5±16.4years (18 - 88). FSSG score at entry was 16.8±7.3 (8 - 45). The follow-up rate for long-term management was 43.1% (91/211). The highest dropout rate was observed in cases in which symptoms persisted in spite of RPZ10mg daily dosing. The symptom improvement rate was 69.9% (107/153). 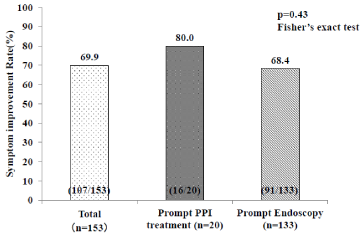 No significant difference was observed between the prompt PPI treatment group (80.0%(16/20)) and the prompt endoscopy group (68.4%(91/133)) (p=0.43). The symptom improvement rate in patients with non-erosive GERD was 60.0% (36/60), which tended to be lower than the 75.3% (55/73) observed in patients with erosive GERD (p=0.08).The highest dropout rate was observed when the patients didn't visit hospital/clinic despite persisting symptoms after PPI treatment or when treated by an optional treatment. The final secession rate for long-term management after RPZ continuous treatment was 9.2% (14/153). Conclusions: With gastroenterology physicians' treatment in accordance with the GERD-GL flowchart, 43.1% of the subjects could be followedup for long-term management. The secession rate for long-term management after RPZ continuous treatment was 9.2%. Thus, few patients discontinued drug treatment if they were followed-up for long-term management of GERD. A major problem was a high dropout rate even when symptoms persisted. The reflux of gastric juice containing acid, bile, and pepsin into the esophagus is a causal factor of gastroesophageal reflux disease (GERD). It was reported that the incidence of GERD has increased significantly in each of the last two decades in western countries . The incidence of GERD is also increasing in Japan as well as in the West  because of the decreasing prevalence of H. pylori infection and westernization of the diet in recent decades. Proton pump inhibitors (PPIs) are commonly used as the first-line treatment because of their effectiveness and prolonged suppression of gastric acid secretion. In Europe and America, guidelines for the treatment of GERD have been proposed. However, there have been few reports on the actual conditions of GERD treatment. In Japan, the GERD management guideline (GERD-GL) was issued by the Japanese Society of Gastroenterology in 2009 (Figure 1). However, until now, there have been few reports on the outcomes of patients treated in accordance with the GERD-GL. The aims of this study were to prospectively investigate the compliance of gastroenterology physicians with the GERD-GL and to clarify follow-up rates to long-term management, dropout rates in each stage, symptom improvement rates and secession rates. Figure 1: Japanese GERD Management Guideline. ≥50% score reduction after dosing. Remission maintenance was defined as patients without recurrent GERD symptoms after PPI treatment during the study period. Subjects with peptic ulcer disease, malignant disease, a history of previous esophagogastric surgery, who had taken antibiotics and prokinetic drugs prior to the endoscopic examination were excluded from the analysis. Informed consent was obtained from all the subjects. One hundred and seventy five patients underwent esophagogastroduodenoscopy (EGD) before treatment. According to the Los Angeles (LA) classification system, esophageal erosions were classified into grades A–D . When no esophageal erosions and ulcers were present, these cases were defined as NERD . Figure 2: Result with Japanese GERD Management Guideline. improvement rate was 69.9% (107/153)(Figure 3). No significant difference in the symptom improvement rate was observed in between the prompt PPI treatment group (80.0% (16/20)) and the prompt endoscopy group (68.4%(91/133))(p=0.43). Of the 175 patients who underwent EGD before PPI treatment, 86 (49.1%) were diagnosed with erosive GERD and 89 (50.9%) were with NERD (Table 3). The ratio of females with NERD was significantly higher than that of females with erosive GERD (p<0.05). The FSSG scores after RPZ 10mg dosing in both erosive GERD (9.0±7.8) and NERD (6.2±6.1) were significantly lower than those before, 17.9±8.0, 15.3±6.8) (p<0.01). The FSSG scores of NERD patients both before RPZ 10mg dosing (17.9±8.0) and after (9.0±7.8) were significantly higher than those with erosive GERD before (15.3±8.0) and after (6.2±6.1) (p<0.05, p<0.05). 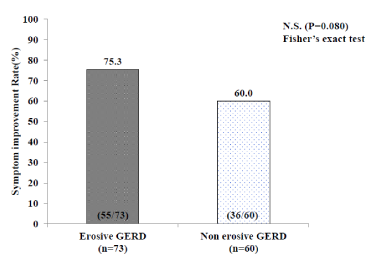 The symptom improvement rate of patients with NERD (60.0%) tended to be lower than in those with erosive GERD (75.3%), but not significantly (p=0.080) (Figure 4). Eleven patients (NERD: 7, LA GradeA:1, B:2, C:1) who did not show symptom improvement after RPZ 10mg dosing, received RPZ 20mg daily. Their FSSG scores after RPZ 20mg dosing (8.8±1.6) was significantly lower than that before (17.6±2.4) and after RPZ 10mg dosing (14.5±1.7) (p<0.05, p<0.05)(Figure 5). Dropout rates at stage 1 (the patients who couldn't be evaluated for symptoms improvement after prompt PPI treatment), 2 (the prompt endoscopy patients who didn't visit hospital/clinic for PPI treatment), 3 (the prompt endoscopy patients who couldn't be followed up for long-term management after symptom improvement), 4 (the patients who didn't visit hospital/clinic despite persisting symptoms after PPI treatment or were treated by optional treatments.) and 5 (the PPI refractory GERD patients who couldn't be followed up for long-term management after pathophysiologic evaluation (e.g. 24 hour pH monitoring)) were 44.4%(16/36),24.0%(42/175), 5.2%(5/96), 73.8%(31/42) and 16.7%(1/6), respectively. Figure 6: Remission maintenance rate (Maintenance treatment and on demand therapy) No significant difference in the remission maintenance rate was observed between maintenance treatment (91.7%) and on demand therapy (71.4%) (p=0.137). acid exposure times or who present reflux symptoms with symptomatic reflux by24 hour pH monitoring . On the other hand, FH is defined according to the Rome criteria as the presence of reflux symptoms with no evidence of symptomatic reflux by multichannel intraluminal impedance monitoring . It is considered that endoscopic examination for GERD does not necessarily indicate either less severe symptoms or a more easily controlled form of GERD in western countries . In Japan, the incidence of GERD is increasing as in the West and it is suspected that Barrett's esophagus and Barrett's esophageal cancer is also increasing secondarily to GERD. Accordingly, the guideline applicable to Japanese, the GERD-GL was issued by the Japanese Society of Gastroenterology in 2009. 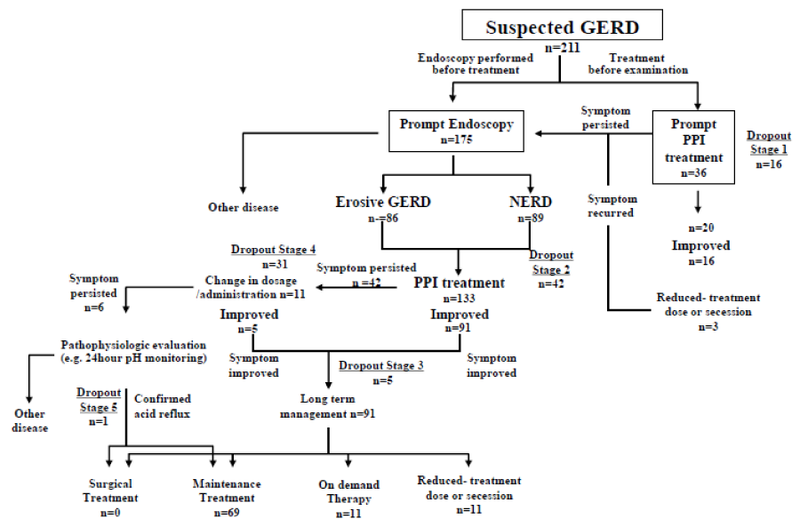 The GERD-GL was based mainly on high quality published evidence and the flowchart was based on individual evidence. However, until now, there have been few reports on the outcomes of treatment based on the GERD-GL flowchart in Japan. There are differences in the standard doses of PPI between Japan and western countries. Furthermore, are where differences in access to endoscopic examination between Japan and Western countries, where patients are initially given prompt PPI treatment followed ambulatory monitoring such as pH monitoring. In fact, in Japan the proportion of prompt endoscopy (82.9%)is larger than prompt PPI treatment(17.1%) in medical institutes with gastroenterological specialists. In the gastroenterology physicians' treatment, which was in accordance with the GERD-GL flowchart, 43.1% (91/211) of the subjects could be followed-up for long-term management. The long-term management rate was relatively favorable in this study. The highest dropout rate was observed when the patients didn't visit hospital/clinic despite persisting symptoms after PPI treatment or when treated by optional treatments. In the stage 4 cases, patients with persistent symptoms despite PPI treatment were generally recognized as PPI-refractory GERD patients. These patients are characterized by PPI-refractory erosive-GERD, PPI-refractory NERD and FH. In this study, these PPI-refractory GERD patients couldn't be distinguished by endoscopic re-examination or ambulatory pH monitoring from PPI-refractory erosive-GERD, PPI-refractory NERD and FH. In Japan, ambulatory pH monitoring is much less common than endoscopy because ambulatory pH monitoring is used only in a limited number of hospitals. The PPI-refractory GERD patients with persistent symptoms appeared to be less sensitive to PPI treatment because such patients could be treated without an accurate evaluation of the pathogenesis. Therefore, the highest dropout rate was observed in stage 4. In patients with GERD, the FSSG score could be used to not only diagnose GERD but also assess the efficacy of PPI treatment for GERD .The symptom improvement rate of RPZ10mg daily dosing was 69.9% (107/153), a relatively favorable rate. No significant differences were observed between the prompt PPI treatment group (80.0%, 16/20) and the prompt endoscopy group (68.4%, 91/133)(p=0.43).However, performing prompt endoscopy can exclude malignant disorders and enable the diagnosis of GERD. For this reason, gastroenterological doctors believe that it is safe to prescribe PPI initially for a long period. Several studies have demonstrated that NERD patients are less sensitive to PPI treatment than patients with erosive reflux disease [14, 15, 16]. In this study, no significant differences in the symptom improvement rate were observed between NERD and erosive GERD. However, the symptom improvement in patients with NERD tended to occur at a lower rate than in patients with erosive GERD,possibly because NERD may include some functional heart FH in this study. The follow-up rate for long-term management was 43.1% (91/211).In long-term management patients, the secession rate after RPZ continuous treatment was 9.2%. Thus, it is difficult for patients to quit drug treatment if they are followed-up for long-term management of GERD treatment. In light of the good remission maintenance rate (71.4%) of on demand therapy, this may be a relatively favorable form of maintenance treatment. In conclusion, in the gastroenterology physicians' treatment in accordance with the GERD-GL flowchart, 43.1% of the subjects could be followed-up for long-term management. The secession rate of long-term management after RPZ continuous treatment was 9.2%. Thus, it is difficult for patients to quit drug treatment if they are followed-up long-term for the management of GERD treatment. Additionally, the problem in GERD-GL was a high dropout rate when symptoms persisted. El-serag HB. Time trends of gastroesophageal reflux disease: a systematic review. Clin Gastroenterol Hepatol. 2007;5(1):17-26. 2. Fujiwara Y, Arakawa T. Epidemiology and clinical characteristics of GERD in the Japanese population. J Gastroenterol. 2009;44(6):518-534. doi: 10.1007/s00535-009-0047-5. 3. Japanese GERD management guideline 2009. The JapaneseSociety of Gastroenterology. Kusano M, Shimoyama Y, Sugimoto S, Kawamura O, Maeda M, Minashi K ,et al. Development and evaluation of FSSG: frequency scale for the symptoms of GERD. J Gastroenterol. 2004;39(9):888–891. Danjo A1, Yamaguchi K, Fujimoto K, Saitoh T, Inamori M, Ando T, et al. Comparison of endoscopic findings with symptomassessment systems (FSSG and QUEST) forgastroesophageal reflux disease in Japanese centres. J Gastroenterology and Hepatology. 2009;24(4):633-638. doi: 10.1111/j.1440-1746.2008.05747.x. Armstrong D, Bennett JR, Blum AL, Dent J, De Dombal FT, Galmiche JP, et al. The endoscopic assessment of esophagitis: a progress report on observer agreement. Gastroenterology. 1996;111(1):85–92. J Dent, J Brun, A Fendrick, M Fennerty, J Janssens, P Kahrilas, et al. An evidence-based appraisal of reflux disease management - the Genval Workshop Report, Gut. 1999;44(2):1-16. Vakil N, van Zanten SV, Kahrilas P, Dent J, Jones R; Global Consensus Group, et al. The Montreal definition and classification of gastroesophageal reflux disease: a global evidence-based consensus. Am J Gastroenterol. 2006;101(8): 1900–1920. DeVault KR, Castell DO. Guidelines for the diagnosis and treatment of gastroesophageal reflux disease. Arch Intern Med. 1995;155:2165-73. DeVault KR, Castell DO. Updated guidelines for the diagnosis and treatment of gastroesophageal reflux disease. Am J Gastroenterol 1999; 94: 1434-42. De Vault KR, Castellet DO. Updated guidelines for the diagnosis and treatment of gastroesophageal reflux disease, Am J Gastroenterol. 2005;100(1):190-200. Venables TL, Newland RD, Patel AC, Hole J, Wilcock C, Turbitt ML. Omeplazole 10 milligrams once daily, omeplazole 20 milligrams once daily or ranitidine 150 milligrams twice daily, evaluated as initial therapy for the relief of symptoms of gastroesophageal reflux disease in general practice. Scand J Gastroenterol. 1997;32(10):965-973. 13. Galmiche JP, Clouse RE, Balint A, Cook IJ, Kahrilas PJ, Paterson WG, et al. Functional esophageal disorders. Gastroenterology. 2006;130(5):1459–1465. 14. Tew S, Jamieson GG, Pilowsky I, Myers J. The illness behavior of patients with gastroesophageal reflux disease with and without endoscopic esophagitis. Dis Esophagus. 1997;10(1):9–15. 15. Lind T, Havelund T, Carlsson R, Anker-Hansen O, Glise H, Hernqvist H, et al. Heartburn without oesophagitis: efficacy of omeprazole therapy and features determining therapeutic response. Scand J Gastroenterol. 1997;32(10):974–979. 16. Richter JE, Kovacs TO, Greski-Rose PA, Huang section sign B, Fisher R. Lansoprazole in the treatment of heartburn in patients without erosive oesophagitis. Aliment PharmacolTher. 1999;13(6):795–804.